Rosie The Riverter Did It!|PaintnPartyOR|Join the Party! THE "ORIGINAL" ROSIE THE RIVITER 94 YEARS OLD "CAN DO IT"
all skill levels JOIN our PARTies FROM 4-94! 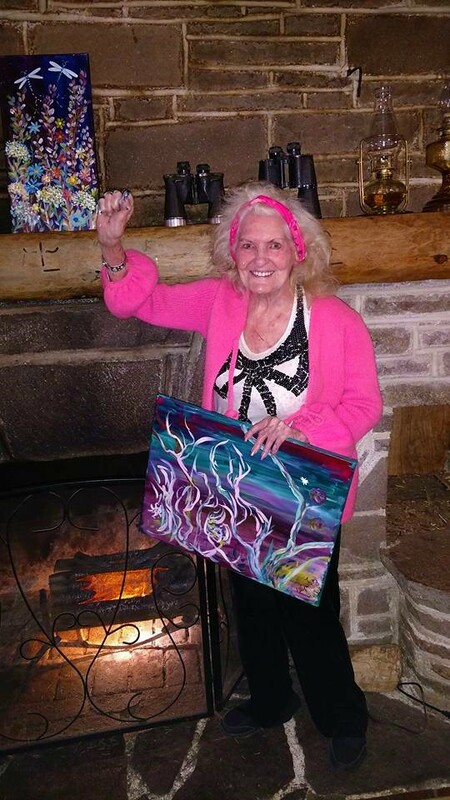 Your Group follows easy painting steps from Artist and Owner Maxine, who shows all skill levels from first timers to frequent flyers to create a one of a kind masterpiece while you PaintnParty with friends and enjoy tasty food and drink from the venue! based in salem, OR. YES, WE consider travel to your place-Ask Us! OUTDOORS WINE AND CANVAS PAINTING PARTY! host or join the party-celebrate all occasions! Over 4,000 HAVE JOINED! PaintnPartyOR is Perfect for birthday parties, clubs, bridal showers, team building, mother's day, special occasions, girls night out and date nights! We set the tables, provide the materials, supplies, aprons and you enjoy tasty food and brews from the venue in trade for using their place and bringing them more business! "but i can't even draw stick figures!" - "YOU can do it"! AND ya, rosie did IT!